Friday's release of 1,128 pages span a range of other issues, including the genocide in Rwanda, judicial confirmations, Osama bin Laden, and Haiti. Downplaying Rwanda? In what appears to be handwritten notes from Bill Clinton on a June 7, 1994 document, the then-President de-emphasized the certainty of genocide in Rwanda. The document was prepared by Susan Rice, then Director for International Organizations and Peacekeeping, and mentioned “reports that genocide has occurred in Rwanda…” Clinton appears to have changed the language to suggest less certainty that genocide had occurred. Clinton later called U.S. inaction in Rwanda one of his biggest regrets, suggesting a small U.S. presence could have saved 300,000 lives. Susan Rice herself has faced criticism over her handling of the public use of the word “genocide” to describe the killings in Rwanda. According to human rights activist and now President Obama’s Ambassador to the United Nations Samantha Power, Rice herself politicized the decision to use the term at a meeting asking, “If we use the word 'genocide' and are seen as doing nothing, what will be the effect on the November [congressional] election?" How big of a threat is Osama bin Laden? Bill Clinton privately questioned the Central Intelligence Agency’s assessment of bin Laden in a note to National Security Director Sandy Berger, following an article he read about the Al Qaeda leader. Ruth Bader Ginsburg’s ‘failure to make eye contact’: In a July 14, 1993 memo from Ron Klain to adviser David Gergen, Klain highlights what he thinks are potential “pitfalls” and “dangers” in Ginsburg’s preparation for her Senate confirmation hearings for the Supreme Court. The Sonia Sotomayor of 2009? A history-making Supreme Court nominee who sailed through the Senate on a bipartisan vote of 68-31. The Sonia Sotomayor of 1998? A U.S. Court of Appeals nominee that a concerned White House report said had posed "more problems than any of the other Hispanic judges sitting on the federal bench." Any future nomination to the Supreme Court, the report concluded, "may prompt a vicious attack from Senate Republicans." Sotomayor's nomination by Clinton to the Second Circuit initially flew through the Judiciary Committee, with a vote of 16-2. But opposition grew as she (along with another nominee) sat in limbo for 18 months. And so we come to the 1998 report, written the year she was confirmed. No author name is attached to the assessment, which offers both praise and political caution. For example, it credits Sotomayor as having a strong professional career and unmatched educational credentials. But it also bluntly cautions that Republicans saw the future Supreme Court justice as a "judicial activist" and that several "controversial issues" and concerns surrounded her nomination. When asked about her decision to hear (and not dismiss) a discrimination case from a gay prisoner, the report concludes, "Unfortunately, Sotomayor's explanation that she is required by law to accept a plaintiff's claims as true... was expressed in somewhat condescending terms at her hearing." Sotomayor's 1993 words criticizing mandatory minimum sentences and one sentence in particular as an "abomination” meant she was being targeted as "soft on crime.” The report also points to statements she made sympathizing with defendants as "victims of economic circumstances." The report notes that her decisions never reduced sentences, but said that fact has often been "overshadowed" by her bench statements. "The issues have, to date, plagued Sotomayor's nomination," the assessment concludes. The author ended with some potentially back-handed compliments and a sharp prediction, writing, "Her fierce independence, and her no-nonsense style are admirable, but her nomination to the Supreme Court may prompt a vicious attack by Senate Republicans." Sotomayor may have taken lessons from the assessment. In 2009, facing sharp scrutiny for her "wise Latina" remark, the future justice quickly disavowed the comment as a failed rhetorical flourish and began a charm offensive with both sides of the aisle. Snarkiest draft of a presidential speech ever? Among the documents dumped by the library are a series of innocuous drafts of speeches given by Bill Clinton. There’s one draft that takes snark to a whole new level. An alternative draft for Clinton’s commencement speech at the Air Force Academy, which he delivered May 31, 1995, included a paragraph ripping into Congress for moving too slowly on an anti-terrorism bill. The speaker of the House referred to in the speech was CNN “Crossfire” co-host Newt Gingrich. Of course this suggested passage never made it past the draft stage. It is crossed-out with a hand-written note in the margins that reads “this is crazy!” It’s not clear who wrote the note. The draft appears in the Anthony Blinken section of the documents released by the library. The Bush dog joke you never heard: In a draft speech prepared for Bill Clinton’s appearance at the 1997 Alfalfa Club dinner, a speechwriter’s joke went too far for someone in the White House. However, it was crossed out of the draft and it appears Clinton never used the quip in his speech. Socks was the Clintons’ cat while they lived in the White House. Millie was George H.W. and Barbara Bush’s dog. The Clintons later acquired a dog named Buddy. Deliberations on Haiti: Anthony Lake, who served as Clinton’s national security adviser in 1994, detailed in a couple of memos how the president could authorize the use of force in Haiti without a vote in Congress. Dealing with Putin: With the White House currently struggling in its relations with Russian President Putin, it's interesting to look at discussions about handling Putin 14 years ago after the Kursk submarine disaster, in which 118 sailors died. In a memo on August 23, 2000, National Security Council press aide Philip Crowley said they needed "succinct answers" to questions President Clinton might get after a departure statement that morning. One topic listed was "Are you concerned about the way in which President Putin and the Russian government handled last week's submarine tragedy?" A possible question asked whether "the deceptions and insinuations that this might be the result of a collision with a U.S submarine appears to be yet another indication that Russia is reverting back to a Cold War psychology?" National Security Council senior director for Russian affairs Mark Medish suggested in a response memo, "I and all Americans were deeply saddened by the tragic loss of life aboard the Kursk. Our thoughts and prayers are with the Russian people and with the families of the brave sailors who perished." NSC senior director for foreign policy speechwriting Tomasz Malinowski responded: "Do we really have to avoid answering that? Can't we say that in bad old days, this kind of thing happened all the time, and no one ever knew about it. Whatever you think about the way this tragedy was handled, the fact is, everything is out in the open and the government is being held accountable. A sign of how far Russia still has to go - yes - but also a sign of how far it has come". Medisch wrote in a follow-up: "I have a different view - that using every event in a foreign country's life to lecture about democracy is unnecessary. Isn't it enough that the Russians are saying it themselves? CNN’s Sean Kennedy, Alan Silverleib, Lisa Desjardins, Elizabeth Hartfield, Ashley Killough, Rachel Streitfeld, Erin McPike, Steve Brusk, Emily Rust, and Dan Merica contributed to this report. Oh no. The tin foil hats are pouring over these to see if the word "the" can be spun into a new conspiracy theory. Latest Issa hearings are clearly debunking the Bengherzi CT so they need some new fantasies. Bill Clinton had more than one opp to take out 0sama Bin Laden and prevent 911 but he was to busy at the time you know what i mean la la la gag and Hillary was hearing voices in her head at the time for a good reason . In the next door down Is what is is ? I am so glad Bush straightened that all out and prevented 9/11. Or not. You're suggesting that a "preemptive assassination" should have been carried out. Really? How would that work? Do we go into a foreign country with a public display of a show of force? Do we go in with subterfuge, using exploding pens and cars with ejection seats? You right wingers have lots of wild and crazy ideas, but are clueless when it comes to actually implementing them. 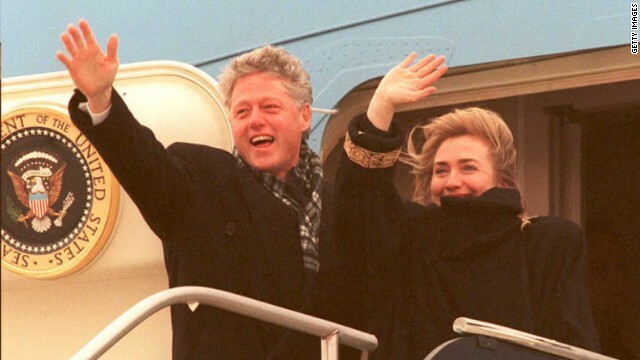 I love that picture of the Clintons waving good bye. don't they know they are supposed to stay gone? the country isn't going back to the 90s on the back of a dinosaur named hillary clinton. Did the docs say anything about lying on the tube to the amerian PPl during family hour to no end ? Poor poor kids are still hearing the bs on a daily basis from the if it feels good do it dems . We don't need the Clinton Crime Syndicate in the White House. They still haven't gotten the stains out of the carpets from the last time these Arkansas hicks pitched their tent there. His opportunity was after the bombing of the U.S.S. Cole. There was a plan put forth to get the Taliban and bin laden in Afghanistan. They needed basing rights from Uzbekistan which required the CIA and FBI to sign on which they refused to do because there was no evidence that bin laden was responsible for the Cole bombing. We later found out after Clintons tenure that he was in fact responsible for it. Clinton actually did everything he could to get him but ultimately failed. At least he did something. Bush had all of the Clinton intelligence on bin laden and had not 1 single meeting on him for 9 months before 9/11. Just Bill's way of keeping Hillary in the limelight.........and of no particular consequence. @rudy what was W to do ? Just let planes just keep hitting our backside just like 0bama is doing on the border its about the same thing if you think about it bud if you think about it ? Sometimes you have to standup if we want to survive right or wrong or ppl will take us out if the border crisis keeps up our apple pie will be cinnamom crisps . Dubya was supposed to have been reading his intelligence briefings with his national security team. Love your posts btw. Keep up the good fight and welcome to the team. Speaking of "teams", I hear you reached the varsity squad. Congrats!!!!! Well if it isn't one of our regular Usual Suspects too old to be on the rag but acting just as b itchy. It appears that Rudy was wrong, you are indeed funny. Now go back and work on the hate-filled, willful ignorance aspect of your personality and you will be well on your way to a full recovery Nurse Ratchett...oh but wait, there's still that Rethuglican thingy. And if it isn't the "head" cheerleader with a new set of kneepads but still unable to debate on her own merits. Well, at least the gang has a servicer, if nothing else. Seriously. Fox News needs to receive the Noble Peace Prize for anti-journalism. Never again in my lifetime will I be able to witness the dumbing down of America in such a sort space of time. Dems cant chant americas problems away on the capital building steps in D.C i promise an besides its imbarrassing to watch . Sorry, Fox News is a smashing success precisely because it is not the propaganda wing of the Democrat Party. Before Fox News, people had no choice but to listen to the leftist controlled media in this country. The lies of the left were stated as truths. Yes, President Obama says we can all keep our healthcare plans, here, here, yes, he says it so it must be so. Vote for this Great One who says we can have everything at no cost. The lefties just hate Fox News because they cannot control it and even worse, they cannot debate ideas and win. As you have done, resort to name calling, admits you have nothing to offer. I have no idea what name calling you are suggesting I resorted to, nor do I care. I presume you are part of the Fox network, so hey ... enjoy. Yes I just loved their honest non-biased promoting of the Obama birth certificate, Palin's death panels, getting arrested if you don't sign up for ACA, "jesus is white", Hannity all around, and generally denying science. Seriously (not) though, the New Yorker gave it a joke Pulitzer prize for fiction once. And that is the only "Pulitzer" prize. Well W did stand up. And he invaded the wrong country. And lied about it. You must be so proud. At least Putin invaded what he wanted before he lied about it. Excellent post say What. An accurate and precise example of what Lynda had pointed out. Actual proof of the dumbing down of America in one succint and humorous post (debate ideas.... classic!). So, you enjoying President romney, because that is who faux news said had won the election... even hours after we all had went to bed they were trying to convince rove and the other idiots they had been lied to, conned, brainwashed, whatever you want to call it...(the earliest Presidential election night ever, for me... slept like a baby. While you and your ilk cried like babies). Keep watching... pretty soon your IQ level should drop to a sufficient level you will cease to remember to breathe... I'm sure it will be a massive loss to the entire trailer park. "Unable to debate". Is that what right-wing nutjobs tell themselves when people tell them that there's no debating with liars and spinners, and etch a sketchers? But it's okay dear, you go right ahead and keep deluding yourself into thinking you're one of the great debaters when those of us that know you best know you're nothing but a Great Pretender. Take a bow sugar and give it a rest! Hey Nurse Ratchett! Wanna go another round? You know what happens to Wonder Bread when you dip it in Dominican coffee? Why would you even THINK to step off the curve with me?! Must be true what they say, Rethuglikkklans ARE nuts.